Lloyd Minor et al described dehiscence of the superior semicircular canal as a cause of conductive hearing loss (CHL). Other "third-window" lesions of the otic capsule have since been reported as causes of CHL. , We describe depressed vestibular evoked myogenic potentials (VEMP) thresholds secondary to bilateral posterior semicircular canal erosions. One side had an additional conductive hearing loss while the other had normal pure tone thresholds. Variability in the expression of this syndrome is further illustrated with a second case report of superior canal dehiscence without disequilibrium. Two recent case series also report posterior canal dehiscence (PCD) caused by a large jugular bulb. , Our patient's bilateral dehiscences in the face of variable symptoms and findings illustrate the need for computed tomography (CT) in conductive hearing loss when history, physical exam, and audiometric testing are non-contributory. A nine-year-old boy had a right low frequency CHL stable over a one-year period. The patient denied autophony, pulsatile tinnitus, nystagmus with valsalva, or any vestibular symptoms. There was no history of chronic otitis media. Otologic exam was normal without any evidence of infection or cholesteatoma. Audiogram showed normal bone pure tone thresholds throughout all frequencies in both ears. The left ear's air conduction levels were also normal, but the right showed an up-sloping, low frequency air-bone gap. Tympanograms were type A bilaterally, with no evidence of stapes fixation. 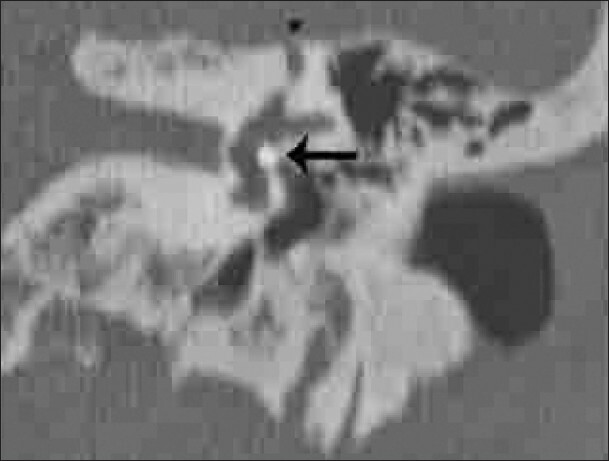 CT scan of the temporal bones identified a large jugular bulb on the right associated with dehiscence of the right posterior semicircular canal [Figure 1]. In addition, there was a dehiscence of the left posterior semicircular canal against the convergence of the cerebellar plate with the middle cranial fossa - the superior petrosal sinus [Figure 2]. Cervical VEMP thresholds were then obtained using 100 rarefaction tone bursts at a rate of 5.1 per 111 s. The thresholds in the right ear were lower than normal at 47dB at 250Hz, 57dB at 500Hz, 77dB at 1000Hz, and 72dB at 2000Hz. Thresholds on the left were also lower than normal at 57dB at 250Hz, 62dB at 500Hz, 77dB at 1000Hz, 87dB at 2000Hz. A 55-year-old female with a history of conductive hearing loss in the left ear had undergone a stapedectomy with a bucket handle prosthesis several years before presentation. Audiograms after the procedure showed no improvement in hearing. On physical examination, both tympanic membranes were unremarkable. Bucket handle prosthesis was visualized through the tympanic membrane with the office microscope. Weber tuning fork testing lateralized to the left ear. Rinne tuning fork testing was positive in the right ear and negative in the left ear. CT scan of the left ear demonstrated the stapes prosthesis in place and a superior canal dehiscence [Figure 3]. The patient had never complained of disequilibrium and had never undergone VEMP testing. Since 1998 when the superior semicircular canal dehiscence syndrome (SCDS) has been first described, several findings have been consistently identified in affected patients. These patients complained of symptoms of disequilibrium that were triggered by loud noises and increases in intracranial or middle ear pressure. Autophony and hearing loss were also common complaints in such patients. Audiograms often showed a conductive hearing loss in the affected ear with an air-bone gap that was most pronounced at lower frequencies. In addition, patients with SCDS demonstrated decreased VEMP thresholds in the affected ear. Several of the symptoms of SCDS can also be seen in other middle and inner ear pathologies, such as Meniere's disease, perilymphatic fistula, and most notably otosclerosis. Therefore, if patients are not properly worked up, they may undergo unnecessary middle ear exploration and surgery. However, as this study has demonstrated, there can be quite a bit of variation in the symptomatology of patients with SCDS. As our two case reports demonstrate, vertigo and disruption in balance is not seen in all patients and conductive hearing loss may be the only presenting symptom. The correct placement of our second patient's stapes prosthesis demonstrates that her conductive hearing loss was caused by the dehiscence of her superior semicircular canal [Figure 3]. PCD as a cause of CHL and vestibular symptoms is starting to become more recognized, as case reports are beginning to surface in the otologic literature. In two recent case series by Friedman et al. and Gopen et al., sixteen patients with a PCD caused by a large jugular bulb , were reported. None of these patients showed PCD against the intracranial dura. Four out of sixteen patients showed CHL, and three out of sixteen patients showed CHL with lowered VEMP thresholds. Vestibular complaints were present in 8 out of 16 patients. Speculation also persists as to how the "third window"-an extra opening in the otic capsule-causes CHL. Perhaps the increased perilymph pressure, caused by stapedial footplate compression, is dissipated at the "third window" when the perilymph fluid volume is displaced into the middle cranial fossa, or against the jugular bulb. Perhaps the subsequent loss of the differential pressure across the cochlear partition causes elevated air thresholds with preserved bone thresholds. Instances of otic capsule dehiscence as a cause of CHL are becoming more apparent. One consequence of this new otologic finding is that CHL in an otherwise healthy ear mandates the search for otologic capsule erosion and dehiscence. The history must now include specific questioning for symptoms of dehiscence. Acoustic reflex testing may help to further narrow down the differential but when the diagnosis is still unclear, the VEMP test should become part of the investigation. As our patients and the recent case series demonstrate, CT of the temporal bones should be obtained before stapes surgery if superior canal dehiscence or PCD could be a cause of the CHL. 1. Minor LB, Carey JP, Cremer PD, Lustig LR, Streubel SO, Ruckenstein MJ. Dehiscence of bone overlying the superior canal as a cause of apparent conductive hearing loss. Otol Neurotol 2003;24:270-8. 2. Brantberg K, Bagger-Sjoback D, Mathiesen T, Witt H, Pansell T. Posterior canal dehiscence syndrome caused by an apex cholesteatoma. Otol Neurotol 2006;27:531-4. 3. Kim HH, Wilson DF. A third mobile window at the cochlear apex. Otolaryngol Head Neck Surg 2006;135:965-6. 4. Friedmann DR, Le BT, Pramanik BK, Lalwani AK. Clinical spectrum of patients with erosion of the inner ear by jugular bulb abnormalities. Laryngoscope 2010;120:365-72. 5. Gopen Q, Zhou G, Poe D, Kenna M, Jones D. Posterior semicircular canal dehiscence: First reported case series. Otol Neurotol 2010;31:339-44. 6. Minor LB. Clinical manifestations of superior semicircular canal dehiscence. Laryngoscope 2005;115:1717-27. 7. Merchant SN, Rosowski JJ. Conductive hearing loss caused by third-window lesions of the inner ear. Otol Neurotol 2008;29:282-9.